OK, I am biased, I love sushi. 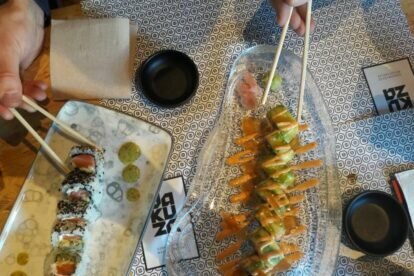 But even if I didn’t, these rolls are so original and tasty that we must talk about them: rich ingredients, big pieces, original combinations and colorful presentation. And one of my favorite ingredients of all time: fried banana. I know, I must be crazy to think of fried banana in a Japanese restaurant, but that’s the whole point: to think outside the box. Trust me when I say you will love the rolls with it: “Cachicamo” or “Guachimán”. Yes, those are the names in the menu. Funny and exotic. If by any chance, you do not want to try any of their rolls, no problem at all. Regular maki, tartar and gyozas are available; as well as ceviche, edamame and wakame. But as I said, this is a different kind of sushi place, so do not miss the opportunity to try out what makes them unique. You will not find this kind of fusion anywhere else in Madrid. Ask for the Japanese beers too; those are my favorites. Yakuza is now a proper restaurant. It used to be a delivery sushi shop but it has been changing and evolving to offer a better service. You can still take away and order online, of course, but I recommend you come visit and see the uniqueness by yourself. Alejandro is the nicest host and he will explain to you every dish and every exotic roll name if he must.